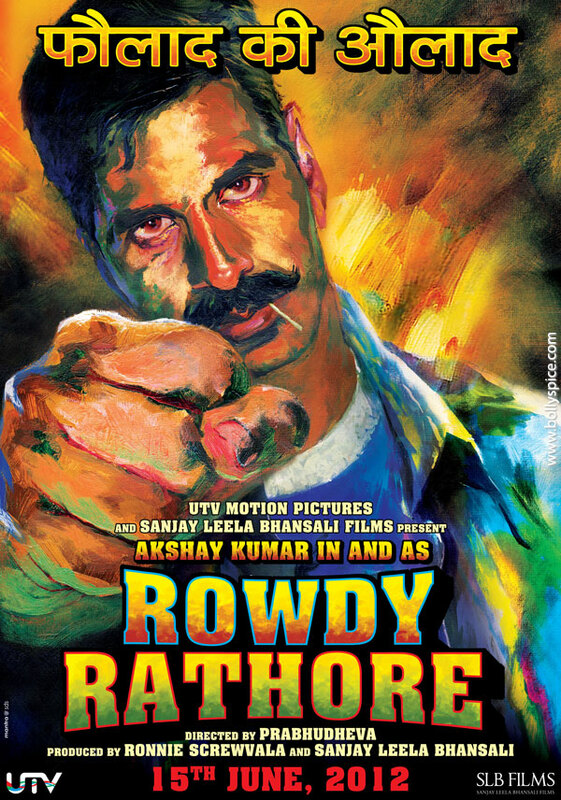 Check out Akshay Kumar’s Rowdy Rathore! Are you ready for Akshay Kumar in a full on action avatar? According to Akshay, ‘Your AK is BACK… not with a vengeance but with Rowdy 🙂 For all my die hard Action fans, this is for you guys!” What film is he talking about, you may ask… Rowdy Rathore! A remake of the Telugu hit Vikramarkudu, Rowdy Rathore is an UTV Motion Pictures Sanjay Leela Bhanshali production. Directed by Prabhudeva, the film, which also stars Sonakshi Sinha, is set to release June 15th, 2012! फौलाद की औलाद Man of Steel, check out the look in Rathore’s eyes, in this exclusive totally cool first poster of Rowdy Rathore! We are loving the look of the art in the hand painted posters! We will have much more to come so stay tuned for all the exclusive scoop!